Labels are an incredibly effective marketing and information disseminating tool which means the printing selection is an important process. There are currently two main forms of label printing – digital and offset (traditional) which generally uses flexography or ‘flexo’. Flexography was developed in the early 1900s and, although it has undergone transformation the past century, is still fairly similar to the original method. This traditional print option uses flexible relief plates and semi-liquid inks which are solvent-based, water-based or UV cured for the perfect finish. High press speeds for quality, full-colour printing. Ability to print on wide variety of substrate materials. Lower cost of equipment and maintenance. All printing and converting processes are performed in-line or single pass through the press. High cost of printing plates, although plates can be re-used for repeat jobs and will last for millions of impressions if cared for. Lengthy set-up times required, sometimes several hours for a complex job. High cost of set-up with waste of expensive label stock. Press time and stock consumed in version changes. In 1993 digital label printing made its way onto the market with the introduction of the Indigo Omnius digital press. While the Indigo label press uses an ink-based digital print technology, other systems use toner based, heat fusion technology or direct ink jet printing, either water-based or UV cured. No printing plates required as the copy is generated by the digital file. Minimal set up time required as it’s all digital. Minimal substrate waste during job setup and version changes. Ideally suited for short runs with multiple version changes. High initial and maintenance cost of equipment. High cost of consumables, primarily inks. Colour limited to print capabilities. Substrate limitations because of ink compatibility or heat associated with laser printers. Finishing is typically done offline to conserve press time. With digital printing suited to smaller orders, they are particularly attractive for ‘limited edition’ products or packaging such as craft beers, personalised wine labels and product specials. Where brand owners are seeking to use mock-ups for market testing, a limited number of units is needed which is also suited to digital print. Digital printing is still more expensive than offset traditional printing on a cost-per-unit basis, but there is often improved quality and speed to counter the cost. 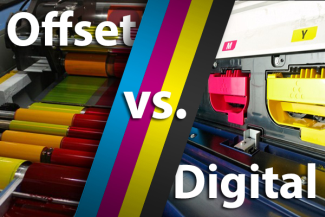 Essentially, the choice between offset and digital printing comes down to the ability of the respective print technology to meet customer needs. There should be efficient end-to-end business allowing for a profitable flow of work, regardless of the printing technique used. Any good print service provider will be able to advise a client on the best option, but it’s always worth going in with some background knowledge beforehand.